Don't you just love all the color! 2. Mix the lemon zest with the herbs and crushed garlic. Lightly slash the chicken breasts using a sharp knife and rub the mixture all over and into the chicken. 3. Put the chicken, potatoes, leeks, peppers, parsnips, and carrots in a large, deep roasting tin. Drizzle with olive oil and lemon juice. Season lightly with garlic powder, celery salt, and black pepper. 4. Roast for 25 minutes, stir everything around, then add the cherry tomatoes and stir again so that everything browns evenly. Roast for a further 25-30 minutes or until cooked through. 5. Check that the chicken in cooked through by piercing the thickest part of the breast with a sharp knife: The juices should run clear. Serve immediately. 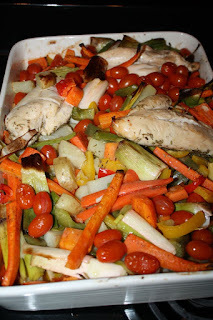 Note: From what I found the veggies needed to be roasted a little longer but the chicken was cooked perfectly. Next time I might cook it at 425 instead. Everything is cooked well I just like my veggies a little darker. Also make sure you cut your potatoes fairly small because they have a hard time cooking through I've found.